The social and political climate of the late 1960s and early 1970s saw transformations across society, and many universities were in the forefront of this movement. Academics were among the leaders of anti-war protests and the landscape on campus was almost as tumultuous. There were diverging views as some academics pursued interdisciplinary research and teaching in some areas, while others stuck steadfastly to traditional models. Social issues such as racism and poverty were also increasingly reflected in university programs, especially in the humanities and social sciences. In the late sixties and early seventies, a wide range of groups were urging governments to open up Australia's tightly controlled broadcast airwaves to different voices and uses. It was the energy and persuasive power of a group at the University of Adelaide who were committed to broadening community access to education - plus an anonymous $100,000 bequest to the University - which eventually broke through. 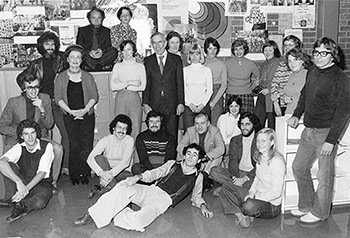 The University was granted the first public radio licence in Australia with the station hitting the airwaves on 28 June 1972. It was known as Radio 5UV until 2002 when it moved to 101.5FM and became Radio Adelaide. The award-winning station is a shining example of the University looking outward and embracing community involvement. Accessible to community members from all backgrounds, it provides high quality training facilities in an inclusive environment that promotes diversity and a global perspective. Radio Adelaide is much more than a campus station - it has a high-power metropolitan licence, now on Digital Radio, streaming online and on 101.5fm - equivalent to all commercial and ABC stations, and is a true icon of Adelaide cultural and community life. 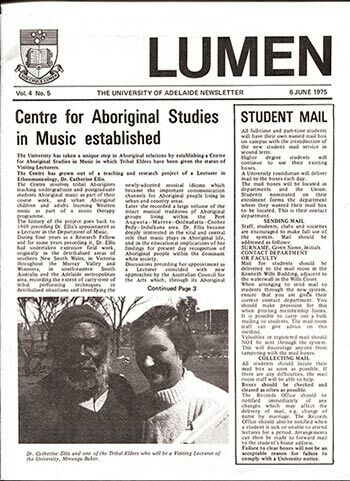 The Centre for Aboriginal Studies in Music (CASM) had its early beginnings in the University in 1971 and grew to become a specialist Australian Indigenous music centre of importance. By the late 1970s it was attracting Indigenous students from around the country and went on to mentor many breakthrough Aboriginal musicians and bands. Today CASM is located within the Elder Conservatorium of Music and remains a unique Indigenous educational and cultural centre. It was a Prosh Day prank to beat all Prosh Day pranks - and it was a great demonstration of the ingenuity of University of Adelaide engineering students. 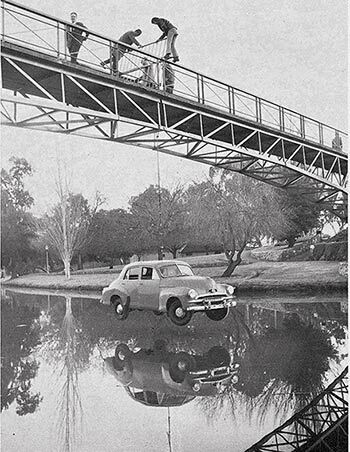 At a 30-year class reunion in 2003, engineering graduate David Gray told the story of how, in 1971, his fellow students suspended an FJ Holden under the University Footbridge. "Under cover of the early hours of one Friday morning, a group of volunteers pushed the FJ Holden under the bridge next to the water on the southern bank of the Torrens," said David. "The car was lifted using beams and lifting gear attached to a small hand-operated crane located on the footbridge. "The crane, with car attached, was then pushed out to the centre of the bridge. The car was firmly secured to the bridge using a large chain. The crane and volunteers then quickly disappeared into the night and were never found." The prank is still part of student folklore. The death of a young soldier in World War I continues to be remembered at Roseworthy campus library through the generosity of his brother Eric Goyne Stephens. Mr Stephens, a Bachelor of Science graduate in 1912, made initial donations in 1975 and 1976 to purchase reference works for the college library in memory of his brother Cyril Forster Stephens, who was a gold medallist at Roseworthy Agricultural College in 1913. In his will, Mr Stephens made a further significant bequest to the college, which is being used to further extend the research collections of the library, with investments from the bequests returning an annual income for further purchases. Today there is material within the library that has been incorporated into the Cyril Forster Stephens and Eric Goyne Stephens Memorial Library and the gifts have been commemorated by a plaque. 1974	Redevelopment of Barr Smith Library links in with construction of Hughes and Wills buildings. 1976	Charles Hawker Conference Centre and building opened at the Waite following a gift from K. Lilias Needham to honour her brother, Charles Hawker, who died in 1938 in one of Australia's worst aviation accidents.